Just recently, I have had to admit being wrong. Very wrong. Way back at the start of October, I was feeling the familiar sensation of panic and dread that only happens right before I need to give a presentation that includes a demo! In the end, there were major problems with the AV setup in the room I was allocated, so even arriving as early I could to set up didn’t give the techs enough time to hook up my laptop successfully. One thing that I was very keen to demonstrate – aside from some nice new features in Java EE 8 – was how quick and easy it is to develop and build MicroServices packaged as Uber JARs with our new Payara Micro Maven plugin. Previously, if you wanted a single deployment unit, you would need to use the Maven Exec plugin to launch Payara during the build and output an Uber JAR. I had found this to be so time consuming in the past, that I never bothered during development. Now, using the Maven plugin made such a difference, I thought this was as good as it gets! Build a project in a couple of seconds and start it in a couple more – how much faster could it possibly get? Even though the use of the new plugin had managed to get rid of a huge amount of time wasted during build, developing my JavaOne demo allowed me to experience some more “real world” pain of rapid minor changes with an application spread over a couple of microservices. Even with very lightweight demo apps, the pain of a couple of seconds to rebuild, followed by another couple of seconds to start is made much worse when several dependent services are involved! My demo had just two microservices, though part of that demo was intended to demonstrate an early implementation of a clustered singleton bean. What this meant for my development process was that I needed to start Microservices A and B – wait for them to initialise, and then start a second instance of Microservice A to show that the singleton bean would only run on one instance. 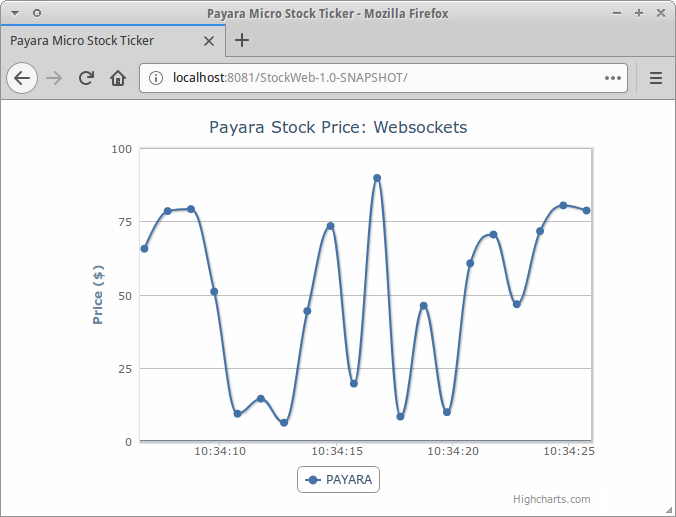 Payara Micro uses Hazelcast for automatic clustering. This comes with an unavoidable startup cost because of the need for discovery of other cluster members. For a single server, there is a --nocluster option to disable this but a major part of my demo is to show off the CDI Event Bus, whereby CDI events can be pushed over the network to be handled by other JVMs in the same cluster. 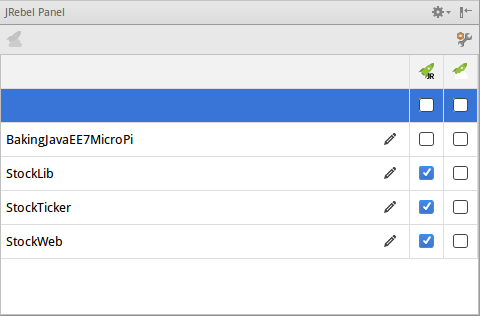 Follow the appropriate JRebel Quickstart steps to get the JRebel agent installed and set up – either standalone or in your IDE. It’s important to run “install” because the Payara Micro Maven plugin has been configured to run the bundle goal at the install phase. Note that the port here is 8081 because port 8080 was already taken by the StockTicker service and --autobindhttp incremented to find the next free port. Since we already have everything configured for JRebel to work, we can make changes to the code right away. We will start by first making the “received stock event” message more informative. That way, we can more easily see how quickly the Stock events propagate between JVMs. 7. Immediately reload the change! 8. Speed things up even more! In the last step, we were still using the maven goals “clean install”, meaning that Maven first removes all existing compiled files and recompiles everything again. Additionally, since I have configured the Payara Micro Maven plugin to package the uber JAR at the install phase, the uber JAR itself gets rebuilt. JRebel doesn’t actually require all this ceremony to detect and reload changes, though, so we can avoid some of that extra work by simply running “mvn compile” which will avoid rebuilding things without changes and, crucially, only compile the classes themselves. What this means is that we need to be careful to actually repackage the uber JARs if we wanted to distribute them for testing. Probably the most important option – tell Maven to only compile the classes in the module where we’ve made changes. JRebel solves an odd sort of problem in that most people don’t realise that they have a problem. As I mentioned above, I thought the development process I had was getting close to as good as you can get! The truth is, I simply hadn’t experienced anything different. Readers above a certain age will remember the age of dial-up Internet. I can still remember the days of having to disconnect when someone needed to make a phone call. Back then, I would visit websites and open multiple links in new windows (no tabs back then!) so that, after opening 7 or 8 links, I knew the first page would nearly be loaded. Browsing the Web in the 90s was an objectively slow experience, but that’s all anyone knew. Going back to those speeds would be unacceptably painful today, even when considering the smaller sizes of webpages in the 90s. It’s easy to see the parallels. Once you have experienced the faster turnaround times of developing with JRebel, it will be very hard to revert to the old way of doing things.